Slow eating reduces the risk of gastric bloat, choking and overeating. Anti-skid base stop the feeding bowl from moving around while eating. Makes your pet's eating fun. Slow dog bowl made from durable food grade and non-toxic plastic. The lixit 30-0685-036 dog water bottle is an opaque, wide-mouth plastic bottle with large ball-point tube cap assembly. 32-ounce capacity. Opaque, wide-mouth plastic bottle with large ball-point tube cap assembly. Expanded; 13cm x 5.2cm (1.27cm flat). 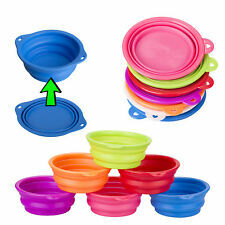 Made from high grade food safe silicone with a 100% BPA free plastic rim for excellent strength, stability and safety. Canvas waterproof water bowl. 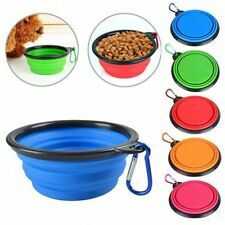 Pet Travel Water/Food Bowl . Use for water or food for your pet. Easily folds and fits into your pocket. Maximum capacity approx. - 2.5 pints, 1.4 litres. Trixie 2472 Dog Feeding Dinner Set Plastic 0.25 Litres / 0.3 Litres Assorted Colours ---Available in Green or Grey, Please message if specific colour is required or colour will be picked at random ---Are you fed up with dog or cat food and water all over the floor ? The "No-Mess Dinner Service" is the perfect answer. 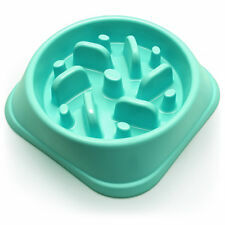 ---Both food and water bowls drop securely into the moulded tray. ---The tray has a high splash back to retain any mess or water. ---The set comes in two sizes: For Cats & SMALL Dogs: Both bowls have a capacity 300ml. 1x 9.5cm and 1 x 11.5cm (inside bowl diameter). ---Tray dimensions 35cm x 47cm ---. This dog bowl has a 3 cup capacity, ideal for food or water. This is prohibited by law. USEFUL LINKS. Dogs Cats Small animals Horses Reptiles Fishes Birds. We know you are excited to receive your stuff. The Lixit Dog Waterer attaches to your outdoor faucet or garden hose, freeing you of dirty water bowls forever. Screws directly onto the water faucet. Made in USA. We would love to hear from you. The item has to be in resalable condition. Dog treat bag made from durable polyester. Easily pull out waste bags from the hole dispenser. 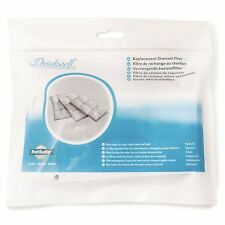 The CampTeck dog treats pouch is very useful with many practical features, great for walking & training your dog. This dog bowl has a generous 6 cup capacity, ideal for food or water. This is prohibited by law. USEFUL LINKS. Dogs Cats Small animals Horses Reptiles Fishes Birds. We know you are excited to receive your stuff. Lixit wide mount bottle for easy filling or cleaning and includes a stainless steel double ball-point tube. Durable, heavy duty, weather resistant bottle. Ideal for ferrets, guinea pigs and rabbits, use on outdoor cages. 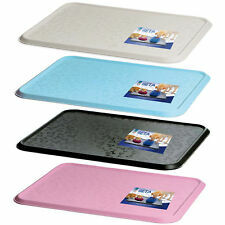 HIGH QUALITY BLACK PET FOOD SILICONE WATERPROOF FEEDING MAT. FDA CERTIFIED FOOD GRADE SILICONE. HAS A SLIGHT LIP TO CATCH SPILLS AND WATER. Lickimat Buddy Treat Mat for Dogs, Cats & Puppies Interactive Feeder Toy Most pet owners lead busy lives and feel guilty leaving their pets home alone for many hours. Lickimat™ Boredom Busters are designed to enhance your pet’s environment as well as benefiting their health. Lickimats are designed as tasty boredom busters for your cat or dog. By spreading your pet's favourite soft treat over the surface, you create a tasty fun game with them having seek out every morsel with their tongue. Freeze treats in summer for refreshing longer lasting entertainment. Lixit no drip dog water bottle has a patented valve with ball tip. Flip top lid for easy filling. The bottle is flat on two sides so it can be mounted inside or outside of a crate. Ideal for travel cages. Water Rover Portable Pet Dog Drinking Bowl - New NEON Colors Available!! Don't let your best friend go thirsty!!! Autoflo Tap Adaptor (by Miller Mfg). 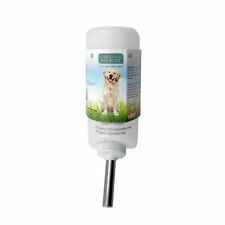 Automatic Faucet Tap Adaptor | Dog Pet Fountain Waterer. Saves water and fun for you pet too! Claim must be submitted for approval before purchasing. Not Finding what you want?. To use, add a little water to the base of the Mud Buster. Then, insert the muddy paw, do the twist, dab the paw dry, and repeat for 3 more feet! The Mud Buster features an array of soft, gentle, thick silicone bristles inside an easy-to-grip tumbler. Splash-proof design to keep floor neat and clean. Constructed of sturdy plastic, made for long-lasting use. Dishwasher safe and easy to clean. Splash-Proof Design To Keep Floor Neat And Clean. This is prohibited by law. Large Slow Feeding Pet Bols Designed to prevent rapid and hasty eating Integrated obstacles will slow down your dog's eating time Reduces risk of abdominal distension and bloat Bowl Size : 600ml / 155mm Wide Overall Size : 155mm x 61mm . The Chill Bowl is the perfect answer. Simply freeze the core for 2 hours, then replace in back in the base and fill with water. The water dish will stay cold for up to 8 hours! Holds 16oz of water. 2 Pet Bowls Stainless No Tip Non Slip Food Water Dish With Paw Print Puppy-Cat.